Kly are a band from Poland that plays an atmospheric form of black metal and this is a review of their 2018 album "Szczerzenie" which will be released on April 20th by Pagan Records. Atmospheric sounding drones start off the album along with some spoken word parts a few seconds later which also leads to a brief use of bass solos before going into a heavier direction while also keeping the atmospheric elements and whispers can also be heard briefly as well as the music bringing in a decent amount of synths. 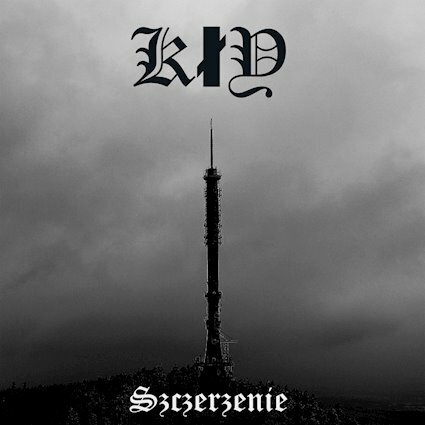 Most of the tracks are very long and epic in length while the music also captures a ritualistic and shamanistic atmosphere at times along with the riffs also bringing in a great amount of melody and the vocals bring in more of deeper style of black metal as well as the slower sections of the songs being very heavily influenced by doom metal. When guitar solos and leads are utilized they are done in a very melodic fashion while spoken word parts also return on some of the later tracks along with some clean playing being used at times which also gives the music more o a progressive feeling as well as the music also bringing in depressive elements at times and when the music finally speeds up a small amount of blast beats and tremolo picking can be heard. Kly plays a style of atmospheric black metal that is very original and different from most bands of this genre and also adds in a new approach, the production sounds very professional while the lyrics are written in Polish and cover mountains, forests, shamanism and contemplation of reality themes. In my opinion Kly are a very great sounding original and atmospheric black metal band and if you are a fan of this musical genre, you should check out this album. RECOMMENDED TRACKS INCLUDE "Wypelni" and "Dale". 8 out of 10.